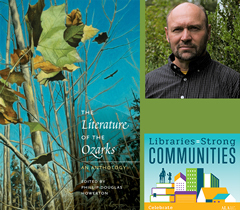 Dr. Phillip Howerton, a professor of English at Missouri State University-West Plains, will present a program about his recent book, The Literature of the Ozarks: An Anthology at 6:30 pm on Tuesday, April 23, at the Rogers Public Library. This program is part of the Rogers Public Library’s celebration of National Library Month, Libraries = Strong Communities. This program will be absolutely free and open to the general public. The Literature of the Ozarks, published by the University of Arkansas Press as the second installment in its Ozarks Studies Series, is a survey of two centuries of Ozarks literature, beginning with an Osage creation story and ending with writings of several contemporary authors. Presenting the work of 41 writers, the anthology divides the region’s literary history into four time periods, introduces topics, themes, and literary trends, and connects Ozarks writing to the larger body of American literature.